The Labconco Purifier PCR Enclosure provides a work area free of particulates when executing polymerase chain reactions. This vertical clean bench uses a HEPA filter to absorb the contaminated air particles down to 0.3 micron, and partners with UV decontamination to minimize down time. The system uses an air down flow design which vacuums out the particulates protecting your workspace making it a clean working environment. The Labconco PCR Enclosure is an ISO Class 5 which was formerly Class 100. This vertical clean bench delivers an optimally controlled environment ideally suited for PCR assays. The PCR Enclosure comes with a UV germicidal lamp allowing you to deactivate RNA and DNA contaminants. The UV Lamp comes with a built-in timer with set seven different set intervals, after which the light shuts off, allowing you walk away ability. 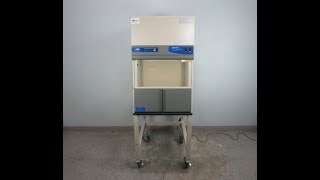 The Labconco Purifier PCR Enclosure come with HEPA filters and blower motor installed. This specialized bench is not intended to provide protection from the user and should not be used with biohazardous material, toxins or radionuclides. This Labconco Purifier PCR Enclosure clean bench has been fully tested for leaks and is currently ready to be shipped out via freight. All our lab equipment comes backed with our standard warranty. Should you have any questions, please don't hesitate to contact us.